Artificial Intelligence is an intelligence of machines and IT systems that work and react like humans. In the recent times, the presence of Artificial Intelligence (AI) has made its presence felt in influencing the customer experience in an efficient way. The efficacy of Artificial Intelligence has come from the results that happened after prolonged advancements in technology. And such advancements have been well justified by the unique results they have produced towards new innovations and better customer experience. Artificial Intelligence helps in connecting with the customers in real time with precision and predictability. It finds hidden insights in the available data without making any random assumption. For example, to take the customer experience to a completely new level, Honeywell used sensors in its products, just to notify users about changes ahead of time. This helped in making customer experience more seamless. Such innovations are taking customer experiences to a completely different level. Let’s try and understand in detail how artificial intelligence is influencing the customer experience nowadays. Chatbots have come up as new and innovative tools to carry on the customer support process with immediate results. Chatbots are usually computer programs that use artificial intelligence to simulate conversational interactions with human users, which also includes automated processes triggered from these interactions. These programs are also aiding a range of industries such as banking, travel, healthcare, education, and others. According to Juniper Research, chatbots will save over $8 billion per annum by 2022. So, in the coming future, the chatbots will be more intelligent and will solve many problems on their own without any need for human intervention. Today the chatbots are so interactive that customers can’t even tell if they are communicating with a human or a computer. The above-mentioned research clearly depicts how intensely artificial intelligence is going to play an important role in the coming future. In addition to cost-saving, chatbots also save time and on an average they save 4 minutes per inquiry when compared to the traditional ways of customer support. Chatbots are also changing the ways how brands stay in touch with their customers and they are fostering brand loyalty among customers. Human customer support may get frustrated, but chatbots are exceptions to such situations. Moreover, they use their intelligence to the very extent while helping the customers with the best possible response. It has been found in studies that the customers look for a quick and frictionless solutions and chatbots are helping in the same context. The impact of Artificial Intelligence and chatbots doesn’t stop only at the intelligent interaction with the customers, but it also covers the essential aspects to make customers have a very personalized experience that could further lead to win a loyal customer base. It is the best foot forward in the customer support environment and it has a lot to do with the customer mindset. And today, there are many ways intelligence is influencing the customer care process. For example, there is a lot of data around here and its documentation is a necessary part that cannot be avoided. Another unique advantage of intelligence is the identification of user pattern. An appropriate Identification of these patterns helps in creating a better customer experience. Companies like Microsoft are already working on emotion detection to understand the tones and expressions of the customers. While writing such programs the developers are making sure that the program should also be able to empathize with the user. The procedure is quite simple, companies must gather the data and fed to an algorithm to analyze the patterns that could lead to some unique results. Companies are improving the overall shopping experience by understanding the users’ actions. By analyzing the buying patterns, the customers can be targeted as per their purchase history and inclination. There are several real-life cases that suggest how artificial intelligence has influenced the customer experience. Such examples prove, how the user experience has gone beyond expectations after the arrival of artificial intelligence. ‘1800 Flowers’ is a floral and gourmet service that uses Facebook messenger chatbots to help customers order flowers. A retailer ‘North Face’ uses IBM’s artificially intelligent supercomputer Watson to create a personalized shopping experience. ‘Dixon Carphone’ uses an artificially intelligent robot Cami to connect online and deliver shopping experiences. Domino’s uses a chatbot called ‘Dom’ to help customers order pizza. Thus, it is evident that artificial intelligence is coming to mainstream not merely as an assistant, but it is creating a completely new pattern of customer experience with lesser number of flaws or human errors. When it was just evolved, it was a complicated process to implement artificial intelligence in different processes. However, its implementation has now been made relatively easier. If the customer’s data has the correct information, artificial intelligence can deliver much better results to enhance the user experience. The data coming straight from the customers is more likely to produce better results. So, all in all, it is like a full circle, first you must take information from the customers directly, use artificial intelligence for information analysis and processing, and finally deliver a service equipped with that intelligent analytics. Capturing effective data is the most challenging task in the process of applying artificial intelligence. And this same issue has been faced by many big companies. Coca-Cola was the very first brand that understood the importance of Big Data and they have shown interest in artificial intelligence as well to create a completely new experience for the customers. Today, Coca-Cola is setting an example to bring success with the help of big data and business intelligence. It closely tracks every data related to marketing or production. Now, the company has an intelligence-driven image-recognition technology to spot when the photographs of the Coca-Cola products or the products of the competitors are uploaded on the Internet. They also use the AI-based algorithm to decide their advertising strategies. In the way, they put their online advertisements very strategically, so that they get more clicks from them. And Coca-Cola is also thinking about using artificial intelligence as a tool to create advertisements. Artificial intelligence is being accepted now on a global scale. According to a report from IDC, the global investment in artificial intelligence is only increasing with time. And in the coming years too, this is going to increase. The global investment is directly proportional to the faith in this technology. And with the passing time, the increasing faith in artificial intelligence has also become possible because of the ongoing contemporary innovations in the cloud. 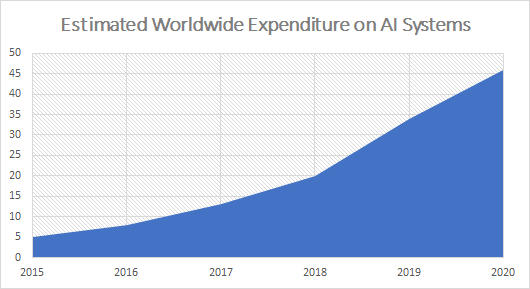 Artificial intelligence will deliver a $1.1 trillion boost to global business revenue and create 800 thousand new jobs in the next five years. According to the PwC report in 2017, 31% of business executives believe that virtual assistance is going to play a very important role in their business. In addition to this, 34% of the business executives feel that such an intelligent technology saves a lot of time when they use digital assistance. Technology giant ‘Tesla’ is also considering artificial intelligence as one of the important technologies that they believe in and are constantly working on for creating a new and a better customer experience. And the reason behind such inclination is the availability of powerful data. All in all, it’s not just about showing a random faith in a new technology, but the growth of artificial intelligence is happening because of the ongoing innovations that are making things much easier for the service providers and customers. Vipul Srivastav loves to explore and share his understanding and ideas related to cloud-based innovations. He is an Editor at Call Center Hosting, which delivers cloud-hosted call center solutions with a global clientele. In his free time, Vipul like reading books and listening to the music.